The expiration of the dog has come full circle. Ever since my daughter went away to camp for the first time, and the paperwork said not to send mail that contained sad news (i.e. an announcement that the dog died), our non-existent dog has died each year while the kids are at camp. At some point during their week away, I send a letter announcing that the dog has died, and the kids are amused (although sometimes their bunk mates are horrified!). The expiration of the dog has been an ongoing joke for five years now. This year, in a strange twist of events, I was the one who went away from home. J and I traveled out of state for an athletic competition. The boys were busy with their own activities back at home, so my boyfriend stayed with them, and kept them company. When the kids go away, it has been my pattern to wait until a few days have gone by before I deliver any news about the dog. 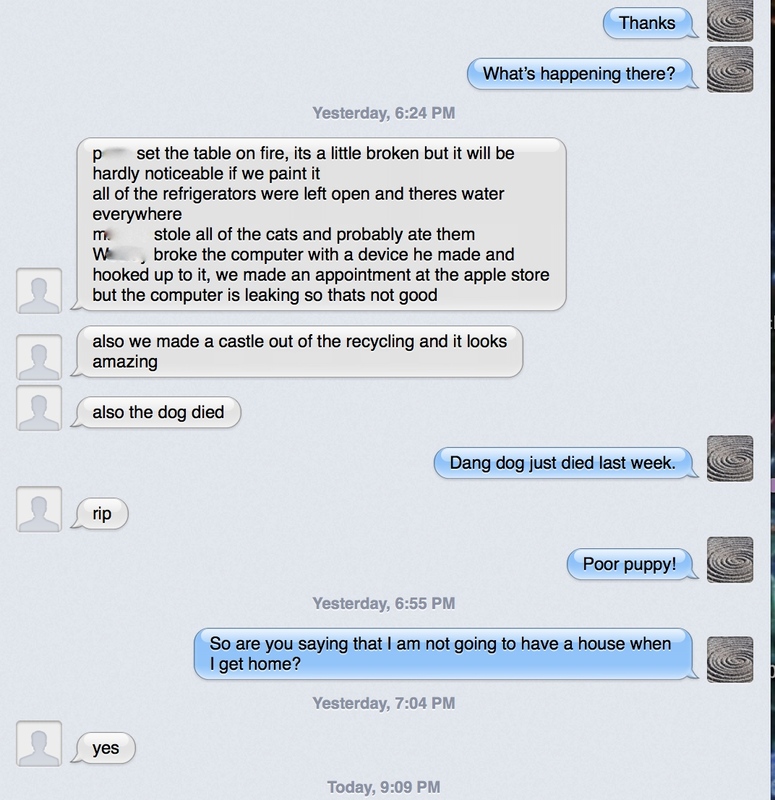 When I left, however, C couldn’t wait to tell me about the dog. Apparently, he felt the need to get it out of his system right away. Perhaps he thought he might forget as the week went by. I had barely landed and settled in my hotel room halfway across the country when the message came. And it was a doozy of a message! Just in case you thought we’d be all right, Mom, here are some of the things you feared could go wrong. Oh, and the dog died. Interestingly, when I got to the part about the dog, I knew that everything was under control, and I could relax. This trip was the first time that I had left home for more than a brief while, and I was on edge, concerned about what would go on in my absence. I had voiced my anxiety to the boys in the days leading up to my trip. As it turned out, I had little to fear. The boys are older; my boyfriend is competent; and just maybe my neighbors were doing a little “neighborhood watch” in my absence…. But I’m glad ‘the dog died’ early in the week. That message relieved me of my worries! Sending letters to camp is not what it used to be. When I was a kid, my mother would send us off to camp, and each day, while she sat at home doing nothing (because what else does a mother do when her children are not home? ), she would take out a pad of stationery and write a note about her day and inconsequential things that had happened. I remember the first time my sister went to camp, Mom asked me if I wanted to write her a letter. But then she cautioned, “Don’t write anything that will make her homesick.” I was eight and had no idea what would make my sister homesick. So I drew an elaborate picture, wrote that the cat had sniffed a blueberry, and I signed my name. We still laugh about that letter…. On Sunday, I dropped my son at camp for a week. Now, what with e-mmediate-mail, it’s quicker to drop the letters off with the child’s camp counselor, or in this case, Scout leader. Of course, W’s Scout leaders have worked hard to earn a reputation for handing out mail (the entire week’s worth) on the day parents are coming for pick up. I decided to circumvent that problem, and give the letters directly to W to read on the correct day(s). I labeled the letters with post-its and packed them in a Ziploc bag (the bag will prevent him from reading mail on the wrong day or reading all of the letters at once, of course). Being seasoned camp-ers, we know all the warnings: Don’t send food, candy, electronics, or any bad news such as news that the dog died. And so…. Because we are cat people, every year, I send a letter to camp informing the child in question that the dog has expired. “You’ll see!” I giggled in response. Over the next few days, my son will read about our adventures in Paris, eating breakfast with a view of the Eiffel Tower; snorkeling off the coast of Australia; and walking the Great Wall of China. Believe it or not, we were able to walk the entire length of the Wall in one day—between our day in Australia and our trip home in time to pick him up. On Thursday, my son will read that the dog accompanied us on our trek on the Great Wall, and did a fantastic job! He will read that the dog is doing well, though resting, after his intensive exercise. Sadly, on Friday W will learn that the trek was too much for our pup, and he expired overnight. Yes, we had a grand adventure while my son was at camp—at least in my over-active imagination. And my son got to read about it from the comfort of his tent. None of my kids can say camp mail isn’t entertaining!